This edition belongs to a very special member of the pet blogging community... our friend Ann of Zoolatry and the Zoolatry Girls. 8 years ago, this month, they began a blogging adventure that has taken them to places they probably never dreamed they would go...affecting the lives of so many humans and their pets through their blogging and Ann's creative skills. During this time she developed a serious case of OCCDPSD, Obsessive Compulsive Cat Dog Photo Shop Disorder)...and so many of us have benefited from her condition that to list them all would be impossible. 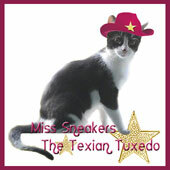 Daddy Kiril, Nikita, Sneakers the Texian Tuxedo and I, Elvira Mistress of Felinity, are deeply honored and proud to count ourselves among them (blog badges , T-shirt image design, a former blog header and a tribute image to Nikita). Through Dec. 2012 she shared her talent for free...before finally making a decision and creating something she calls "The Starving Artist Fund". That Ann considers Daddy Kiril (and by extension us kitties as well) to be "A very witty, charming, industrious and always-good-for-a-laugh writer" and told her readers about our blogging efforts, means a lot to us...as have the many comments she and the girls have left over the years (Now that Daddy Kiril has a new hat and Sneakers has taken over for Nikita, we are contemplating a new version of this badge, hee, hee!). 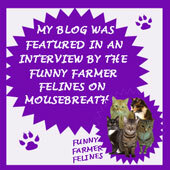 Ann's popular blog is about "Life with all it's exciting and marvelous ups and downs" in her family life and the lives of her cats . 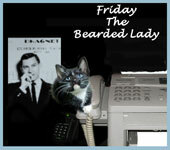 It is also about the awesome creative skills she puts to use for the benefit of the pet blogging community. "Seems hard to believe, and sometime soon among the days ahead, our 3000th posting will arrive as well. Life sure has changed for us over the past 8 years and there have been many times we've been very close to ending these blogging days. Though I must admit, I'm glad that day has not yet come. " 18 and 19. HAPPY FATHERS DAY and the original tribute to Poppy Vic. 1. 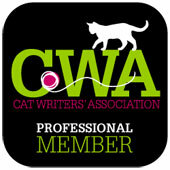 Why I Won’t Write for Huffington Post by Yvonne DiVita of Blog Paws & Scratchings and Sniffings. 2. Did you know that there once was a human car dealer who had strange notions of what a dog looked like? He even mistook the "big" cats for dogs! 4. Happy Father's Day Daddy Kiril! 1. Friday Ark #525 (actually #526, hee, hee!) - Cats, Dogs, Birds, Invertebrates, Other Vertebrates and the Extinct! Oh, my! 2. 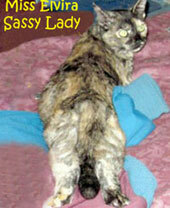 Camera Critters #376 - The oldest active meme about photos of animals/critters! How nice of you to post a Zoolatry retrospective - Ann is such a sweetheart. 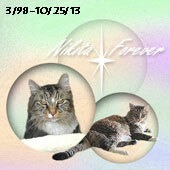 Ann is, she made the header for Meowza's site and badge for Meowza when he passed. She has always been there for the cat blogging community. Awesome carnival too. I will have much fun looking at all the kitties providing my browser doesn't crash. ROFM! (ROLLING ON THE FLOOR MEOWING! OMC, THAT CARTOON WITH THE CATS WITH THE GLASSES AND THE REMINDERS PINNED THE WALL.... TOTALLY TAKEN WITH TODAY'S MULTIFACED INFO AND LOOKING FINISHING IT!! SINCE WE ARE NEW TO THE BLOGGING SCENE THIS WILL GIVE US A CHANCE TO CATCH UP! How delightful to find this edition is in honor of long-time blogging friend to all, Ann of Zoolatry. We have been enjoying her look back over the years. We love the work that Ann does! Mom Paula wishes she had a tenth of the talent Ann has. Thank you for featuring her! Oh what a wonderful Carnival!! Kiril!! We hope you are fine! Lets us know! 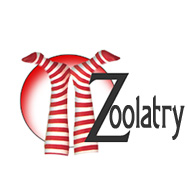 Happy Anniversary to our very special friend, Ann from Zoolatry!!!! We are very happy that she suffers from that OCCDPSD as we have benefited so much from her amazing talents. Even more important, she is a wonderful and caring person whose friendship we cherish. Ann is the best! We are so thankful to her, and for all she does for so many.